HANSON, Mass. – It didn’t matter if it was from deep, in the paint or at the free throw line: #3 Whitman-Hanson was impressive. The Panthers shot nearly 70% from two-point range, connected on eight three pointers in the first half alone and connected on almost 80% of their free throws, taking a 79-66 win over #13 Oliver Ames. It took just four minutes for the hosts to create a double-digit lead. Hitting three of their first five three pointer attempts and going a perfect 3/3 on takes to the basket, Whitman-Hanson was up 15-4 halfway through the opening quarter. The closest Oliver Ames was able to get the rest of the way was six, at 30-24, with 3:45 left to play in the first half. After going down 10 at the end of the first quarter (23-13), Oliver Ames settled in some in the second quarter. A 7-3 run – helped along by a bucket from Dylan Mahoney (11 points, seven rebounds), a three from Nick Welch (16 points, seven assists), and a layup from Jack Spillane (12 points) – brought the Tigers within two possessions at the midway point of the second quarter. But Whitman-Hanson responded with a three from Nikko Raftes (27 points) and a basket underneath from Jacob Hanson-Bartlett (11 points, 5 rebounds) to stretch the lead back to double figures. The Tigers finished the first half on a 5-0 run over the final minute – two free throws from Matt Muir (12 points) and a three from Welch – to stay within striking distance (38-31) at the break. But a slow start to the second half quickly erased Oliver Ames’ chance to get close. A 6-0 run from Whitman-Hanson pushed the lead to 13 before Oliver Ames finally scored in the quarter. Welch hit a three just over two minutes in to make it a 10 point game – an advantage the Panthers held for the majority of the quarter. It wasn’t until a wild final minute of the third quarter that the game became out of reach. Up 50-40, the Panthers managed an 8-0 run in 60 seconds to close the frame. A layup from Lucas Franklin (13 points), a jumper from Luke Tamulevich (21 points, eight rebounds), a bucket down low from Hanson-Bartlett and two free throws from Raftes made it 58-40 heading into the final quarter. The Tigers were forced into a full court approach. Already in the bonus, Oliver Ames attempted steals off the inbounds but often had to settle for fouls against the Panthers. Whitman-Hanson didn’t blink – making 18 of their 24 free throw attempts in the fourth quarter. The Panthers, who did have four turnovers in the final quarter, made 26/33 of their attempts from the charity stripe. Throughout the season, Oliver Ames – as many teams do – thrived on small runs that can change the course of a game. They never got that run though, the best being either the 7-3 run to get within six in the second quarter or the 5-0 run to end the first half. While Oliver Ames gambled and sent the Panthers to the line, their offense came to live. The Tigers scored 26 points in the final frame, with 19 coming in the final four minutes. Senior Carter Evin (seven rebounds) scored 10 of his 14 points in the final quarter. Oliver Ames boys basketball finishes the season 13-11. #1 Mansfield, 77 vs. #16 Brockton, 57 – Final – Mansfield senior Sam Goldberg scored 10 of his 15 points in the first half, helping the Hornets build a nine-point lead they wouldn’t relinquish in the second frame. Mansfield’s offense had its best quarter of the night to start the second half, pouring in 23 points to create an 18-point cushion entering the final eight minutes. Goldberg added 11 rebounds to go with his 15 points while classmate Christian Weber netted a team-high 16 points. Junior Tyler Boulter added 13 points while Max Boen finished with nine points. Mansfield will host #8 Quincy on Friday at 6:30. #7 North Attleboro, 64 vs. #10 Braintree, 67 – Final – North Attleboro clawed its way back into the game on multiple occasions down the stretch but couldn’t overcome the Wamps’ fourth quarter lead. Brent Doherty (26 points) hit six three pointers, including one to cut a seven-point lead to four and one to make it a two point game in the final seconds. Jonny Friberg scored 15 of his 19 points in the second half while sophomore Josh Montague had a career-high nine points for the Rocketeers. Braintree’s Nick Timberlake scored 30 points to lead the Wamps. #13 Attleboro, 71 @ #4 Bridgewater-Raynham, 74 – Final – Click here for a recap of this game. #10 Foxboro, 54 @ #7 Nauset, 51 – Final (OT) – Foxboro saved the best for last, exploding for 21 points in the fourth quarter after having scored just 30 through the first 24 minutes of play. While erasing a seven-point deficit, Mark Clagg (team-high 14 points), Joe Morrison and Matt Rongione each hit a three in the fourth quarter. Jamaine Few scored eight of his 12 points in the fourth quarter and overtime while Anthony Barreira chipped in with a career-high 10 points. The Warriors kept Nauset scoreless in the overtime period while Few had a layup and freshman Brandon Borde had a free throw to win the OT period, 3-0. Foxboro will travel to #2 Westwood on Friday at 6:30. #11 Oliver Ames, 89 @ #6 Milton, 74 – Final – Oliver Ames flexed its offensive muscles, scoring a season-high 89 points to earn the upset on the road. The Tigers scored 20 points in the opening quarter and held a 42-33 lead by halftime. Milton cut into the deficit, trailing just 62-56 after three quarters but the Tigers dropped 27 points in the fourth quarter. Jack Spillane led the way with 26 points while senior Nick Welch had 24 points. Dylan Mahoney added 15 points while both Carter Evin and Matt Muir chipped in with 10 points. Oliver Ames will travel to #3 Whitman-Hanson on Friday at 6:30. #6 Canton, 1 vs. #11 Pembroke, 0 – Final – Click here for a recap of this game. #14 Canton, 4 vs. #19 Norwell, 1 – Final – Sophomore Lauren Fitzpatrick netted a hat trick to lead the Bulldogs to a win in their first tournament game. Fellow sophomore Maggie Malloy also found the back of the net in the win. Canton advances to play #3 Shrewsbury on Saturday the the Northstar Ice Arena at 1:50. Milford, 45 @ North Attleboro, 66 – Final – Click here for a recap of this game. Oliver Ames, 55 vs. Xaverian, 60 – Final – Oliver Ames cut the deficit to as low as one in the final minute but Xaverian converted at the free throw line and survived a game-tying three late to hold off the Tigers. Nick Welch led OA with 21 points while Carter Evin added 15 points and Dylan Mahoney chipped in with 13 points. Oliver Ames will play host Walpole in the consolation game of the Rebels’ tournament. Sharon, 82 @ Walpole, 75 – Final (OT) – Sharon junior Malik Lorquet was nearly unstoppable, scoring a career-high 26 points while hauling in 11 rebounds and adding five blocks for the Eagles. Lorquet did the majority of his damage in the middle quarters, notching 19 points between the second and third periods. With the Eagles up 77-75 in overtime, junior Jimmy Fitzhenry (17 points, five rebounds) drained a three with 45 seconds to go and then hauled in a rebound and hit Jayvon Monteiro on an outlet pass for a layup to ice the game. Ricardo Ripley added 14 points, seven rebounds and five assists for the Eagles, who will play Xaverian in the championship game of the Walpole tournament. Mansfield/Oliver Ames, 9 @ Stoughton, 0 – Final – MOA’s Cat Luciano scored two goals in the game, registering her 100th career point for the Warriors. TAUNTON, Mass. – Oliver Ames head coach Don Byron looked up at the scoreboard and felt a little bit of deja vu as his side took on Taunton. Just like the first meeting, his team had a 12 point lead with the fourth quarter set to begin. In the first game, Taunton roared back to erase that deficit and get the win. 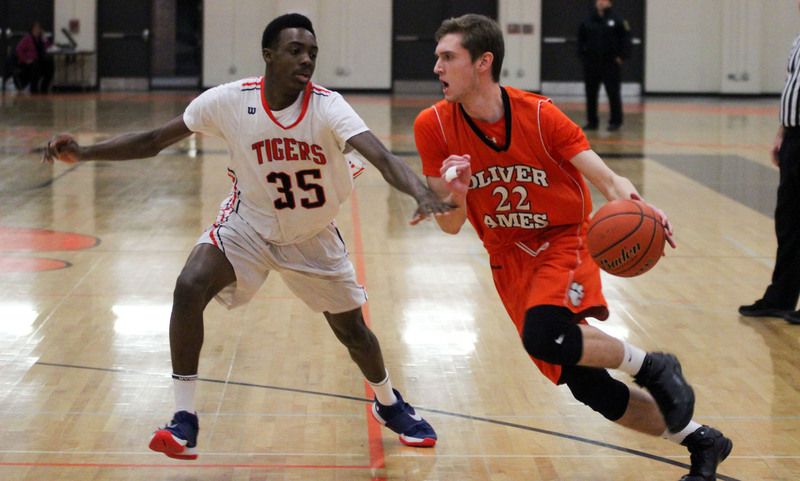 Oliver Ames kept its lead throughout the final period, walking away with a 73-61 win and a berth in the Division 2 State Tournament. It marks the eighth straight year under Byron that the Tigers are postseason bound. OA broke the game open with a big third quarter. After taking a one-point lead (39-38) into the locker room at halftime, the visitors doubled up Taunton with a 22-11 third quarter. Taunton hit an impressive nine three pointers (of 13 total field goals made) in the first half but were limited to just four in the second half. Taunton went just 1/7 from deep in the third quarter. 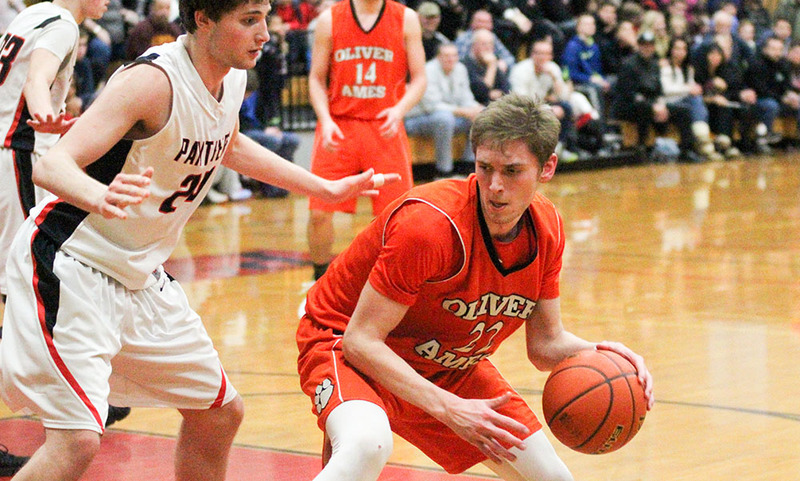 Meanwhile, Oliver Ames was an efficient 9/14 from the floor, getting all of its offense from its starting lineup. Nick Welch (19 points, four assists) hit a layup, Carter Evin (16 points, six rebounds), Dylan Mahoney (17 points, seven rebounds) converted in the post and Jack Spillane (19 points, four rebounds) grabbed an offensive rebound and hit a put back to put Taunton up 48-41. “We didn’t want to look at it as having to get one out of five games left, we wanted to look at it just one game at a time,” Welch said of earning the playoff berth. “We didn’t get it Friday against Attleboro so we were extra motivated to get it tonight. It was a good win against a good team. Another three point play from Evin — who found a home in the post against Taunton’s defense — a three from Welch, two more from Evin, a trifecta from Spillane and suddenly Oliver Ames had a 59-45 lead late in the third quarter. “We wanted to play inside-out,” Byron said. “I thought Carter and Dylan did some good stuff on the block. And Nick’s been terrific…the whole year but specifically the second half of the season. The visitors deployed a press coming out of halftime. Although it didn’t force any turnovers, it wasn’t designed to. Instead, it was aimed to slowing Taunton down. Oliver Ames led 61-49 going into the fourth quarter. “I think it was almost the same lead. We talked about how we had been here before but we weren’t going to do what we did the last time,” Welch said. “We just took that message and went out and got it done. They can get hot quickly so we had to contain the three point line and we wanted to keep the lead at 10. Taunton cut the deficit to nine early in the fourth quarter on a three from Dimitri Barbosa and then to eight on a free throw from freshman Dante Law (19 points, nine rebounds) but that would be as close as the home side would get. Evin pushed it back to 10 with a nice move in the post and OA’s defense kept Taunton off the board for three minutes. A three from Spillane extended the lead to 13 with 3:21 to play only for Taunton’s Tommy MacLean (nine points, six rebounds, six assists) to answer with a three of his own. “You have to get to Mahoney, you have to get to Spillane, you have to get to them all…and we didn’t,” said Taunton head coach Charlie Dacey. “And then we came down the other end and we panicked. We were looking for the five point shot. It was not wise basketball for us on either end of the floor. “[The nine three pointers in the first half] was fools gold. You’re not going to win the game from the three point line, I don’t care who you are. We got seduced by that and started taking the quick early threes rather than working it. Oliver Ames’ defense was able to limit Taunton to 23 points in the second half after surrendering 38 to the hosts in the opening half. Sophomore Luis Vendrell added 19 points for Taunton while Barbosa finished with eight. 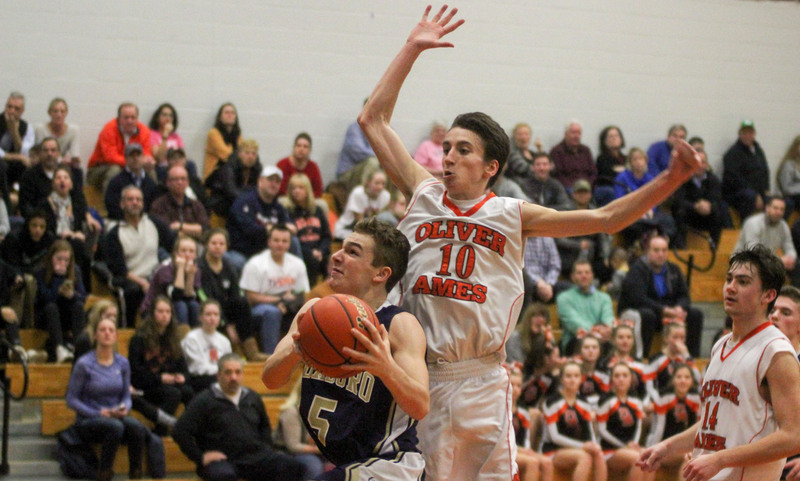 Oliver Ames boys basketball (11-8 overall, 9-6) will try to improve its record for tournament seeding on Friday with a visit to Kelley-Rex champion Mansfield Hornets. Taunton (13-7, 8-7) looks to bounce back with a trip to Attleboro on the same night. NORTH EASTON, Mass. – When Franklin and Oliver Ames played the first time, almost a month to the day from Friday night’s second meeting at the William F. Nixon Gym, the game was essentially over by halftime. The Panthers turned up the defensive intensity, broke the game open, and then pored it on for a 33-point victory. The Tigers were determined that it would not be the same result this time around and, despite Franklin extending its lead to as many as 15 in the third quarter, pulled within five points with only four minutes remaining in the game. With the crowd getting loud and momentum with the home team, Franklin junior Matt Elias (eight points) drilled a clutch three to extend the lead back to eight, Josh Macchi snatched an offensive rebound for a bucket, and then Connor Peterson dropped a pass to Jalen Samuels under the basket for the hoop and the foul. 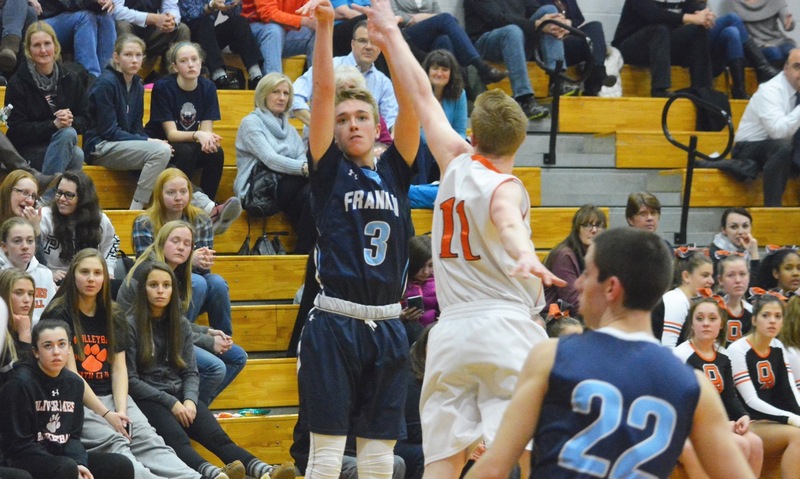 The Panthers made the plays they needed to down the stretch, holding off the OA comeback and pulling out a 64-52 victory that keeps Franklin tied with Mansfield at the top of the Kelley-Rex division (with the two teams set to square off next Friday). OA coach Don Byron got the reaction, if not the final result, that he was looking for from his team after the tough loss to the Panthers in the first meeting. The Tigers got off to a strong start with Dylan Mahoney (team-high 17 points) and Nick Welch (16 points) each scoring five in the first and Jack Spillane drilling a three to give OA a 13-12 lead. Peterson (10 points, 10 rebounds) got the Panthers going with seven in the first and Samuels (12 points) added four, as Franklin closed the quarter on a 14-5 run to grab a 17-13 lead. Franklin added the first four points of the second quarter but Mahoney answered with a shot in the lane and Matt Muir buried a three to keep OA within five. Macchi (12 points, seven rebounds) snagged a steal for a layup and then Samuels closed the half with a put-back in traffic for a 10-point advantage at the break. At the start of the third, it looked like Franklin was about to pull away for another big win. Peterson scored off an offensive rebound and Macchi drilled a three off a Paul Mahon assist. Macchi added an up and under move in the lane to make it 37-22. After four straight from the Tigers, freshman point guard Chris Edgehill (team-high 15 points) drilled the first of his two threes in the quarter to keep the lead at double digits. Carter Evin (nine rebounds), who missed the first game with Franklin due to injury completed a three-point play to make the score 43-35, but Elias came through with a buzzer-beating layup off a Mahon pass to keep it a 10-point game heading to the fourth. A couple of Welch free throws and a layup for Jake Erlich started the fourth well for OA but Peterson kicked it out for a Connor Goldstein three. A pair of free throws from Edgehill pushed the lead back to 12, but OA made one last run at the win. Mike Graziano swung a pass over to Welch for a three to cut the lead to 51-42. Mahoney followed with a three of his own and then drove to the basket to make it 52-47; he scored eight of his 17 in the fourth. “It went to 15 and we got it to five and against a team like that, which defends as well as they do…making runs against some teams happens because there’s a lot of back and forth and up and down, but not too much with these guys,” said Byron. Needing a big shot, Franklin swung the ball around to Elias and the junior delivered with the three that stemmed the tide. The win was an important one for the Panthers, who are battling to win their second straight league title (they shared it with Mansfield last season). Franklin (12-3, 11-1) will get another tough league test on Monday when Taunton pays a visit, while Oliver Ames (9-7, 7-5) will try to clinch its playoff spot at home against King Philip. NORTH EASTON, Mass. – There wasn’t much Oliver Ames could do wrong through the first quarter, and again in spurts in the second quarter. After the first eight minutes, the Tigers held a 21-2 advantage and by halftime, took a 20-point lead into the locker rooms. When all was said it done, they needed that cushion created in the first half. Foxboro crafted a spirited rally throughout the final 16 minutes, cutting the deficit to single digits in the fourth quarter but couldn’t get over the hump as Oliver Ames earned a 63-54 win inside William F. Nixon Gymnasium. “I don’t know if we could have played much better than we did for about a period and a half,” said OA head coach Don Byron. “For that stretch, that’s about as well as we played. There were no illusions that wouldn’t continue for an entire game. We knew they’d make a run at it. We did some things in the second half to make it frantic. They ran a second guy at us and we got a little sloppy with the ball, we got a little undisciplined on the offensive end. The Tigers went 7/16 from the floor, including a trio of trifectas – one from Dylan Mahoney (19 points, 10 rebounds) in transition right at the buzzer to put an exclamation point on the quarter. After Foxboro scored the opening bucket of the game via freshman Brandon Borde (nine points, five rebounds, four assists), the Warriors went 0/8 from the field and committed eight turnovers against OA’s 2-3 zone — many of the turnovers turning into points for the Tigers. Nick Welch (11 points) and Jack Spillane (five points, six rebounds) also connected from beyond the arc in the period while Carter Evin (19 points) was perfect from the floor for six points. Foxboro was a equal opponent, if not greater, the rest of the way. The Warriors outscored OA 51-43, over the final three quarters but never cut the deficit to under eight. Foxboro senior Mark Clagg scored 13 of his team-high 16 points in the second half. While Oliver Ames obviously relied on its hot start, the Tigers put together maybe its most important run of the game in the fourth quarter. Two free throws from Foxboro’s Anthony Barreira with just under five minutes brought the Warriors within 10 at 53-43. Oliver Ames responded with a timely 6-0 spurt in just over 30 seconds to retake command of the contest. Evin netted a layup off a feed from Mahoney, Mahoney converted for two of his own after a Foxboro miss and Evin converted a put back after a shot was blocked by Foxboro’s Joe Morrison (12 points, four rebounds, four steals, two blocks). “We emphasize just that,” Byron said. “It’s not the 18-2 runs, it’s the series of 6-0 runs that you can put together and if they are timely, even better. Foxboro kept its pressure on, rattling off an 8-1 run capped by Teddy Maher’s second three pointer of the half to get within eight (60-52) with just over a minute to play but the Warriors ran out of time to complete the comeback. Barreira and Maher, mostly known for their defensive efforts, turned in strong performances on both ends of the court. Barreira had eight points, seven rebounds and a pair of assists while Maher knocked down a pair of big three pointers, had two assists and three steals. Oliver Ames (8-6 overall, 6-4 Hockomock) moves into sole possession of third place in the Kelley-Rex with a game in hand. The Tigers are back in action on Tuesday with a trip to Canton. Foxboro (4-8, 3-7) looks to snap its three game skid on Tuesday with a visit from Attleboro.